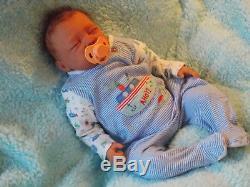 Beautiful Hand Made Reborn Baby Boy - Jack. By Michelle Maydew at Adore Reborn Nursery. Custom orders are normally completed in 2 weeks but this can vary during busy periods. Pictures are of other babies created by our Artist Michelle at Adore Reborn Nursery. Your baby will look as close to the ones pictured as possible but please note the clothes & accessories will vary. Does arrive with a magnetic dummy! Please be careful around people with pacemakers! If you prefer to have this removed please message us. This lovely little newborn baby is available for special order! 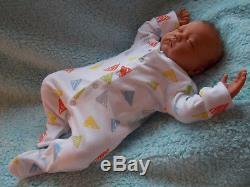 Jack is a 20 inch baby with 3/4 limbs, a soft cloth body and is weighted to feel like a real baby in your arms. 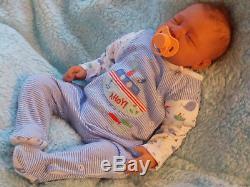 This beautiful baby boy is a 20'' baby (newborn size) and can weigh anything from 4 - 7lbs. 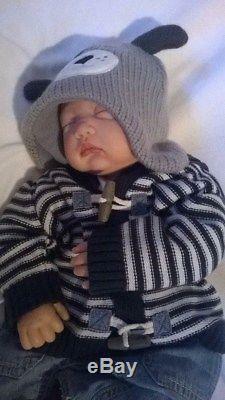 He wears Newborn & 0-3 month clothes. He will have natural look tipped finger and toe nails Moist look to the mouth and corners of the inner eyes for that extra touch of realism Moveable poseable soft cloth disc jointed bodies Jack also comes with a magnetic dummy (strong earth magnets are used please take care around people with pace makers, please let us know if you DON'T want the magnet) Each reborn baby created at Adore Reborn is hand painted by our dedicated in house artist Michelle Maydew using many layers of Genesis heat set paint, creating lifelike skin tones including veining and mottled layers, and finished with matt varnish to seal. Your baby's hair is micro rooted with a very fine needle to ensure realism and is sealed on the inside ready to be carefully brushed & styled. Fine eyelashes are included to complete the look. 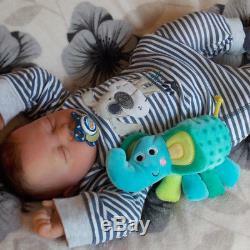 Your baby will arrive home with an outfit, magnetic dummy (optional), blanket, teddy and a few little extras.. 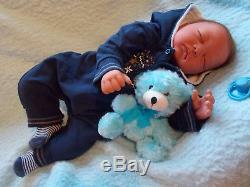 The item "JACK Beautiful Lifelike Reborn Baby Boy 20 Newborn Doll Asleep" is in sale since Wednesday, October 10, 2018. This item is in the category "Dolls & Bears\Dolls, Clothing & Accessories\Artist & Handmade Dolls\Reborn Dolls & Accessories\Reborn Dolls". 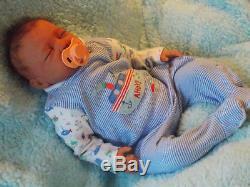 The seller is "adore_reborn_nursery" and is located in Stoke-on-Trent.